Winter tends to drag on, but thankfully Spring arrives, and with it comes turkey hunting season. 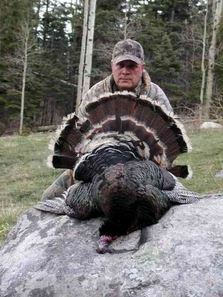 This year, turkey hunts run April 15 to May 10 in northern New Mexico via JACO Outfitters, LLC. What are some reasons to go on a turkey hunt this Spring? When’s the last time you heard turkeys gobblin’ nearby? Chances are it has been a while. Spring brings with it “excitement in the air,” as it’s a good time to get out on the land and see what you can find on your hunt. Bring a buddy with you and take turns calling in a turkey. It’s the kind of bonding experience neither one of you can soon forget. Plus, most people have been cooped up all Winter, so any chance to get out of the house, especially on a hunt with a trusted buddy, can be a fun time for sure. Got kids? Why not bring them along for the Spring turkey hunt and get them away from their smartphones and iPads? Spring weather is generally decent. It’s nice to spend time with kids outdoors, and, if you’re a hunter, this is a good way to expose kids to what you love doing, with the hope that they’ll grow to love it too. Chasing turkeys garners a lot of laughter, by the way, and we could all use a good laugh! JACO Outfitters, LLC takes people of all ages out on the land of northern New Mexico for guided Merriam turkey hunts. Hunting lands are in the Sangre de Cristo Mountains, so bring your camera to take some pictures of the beautiful scenery. The nice thing about hunting in this area with JACO is that tags are available over-the-counter and not subject to any draw requirements. In New Mexico, there’s a two turkey limit. JACO hunts include three full days. You won’t have to worry about where you’ll sleep, what you’ll eat, or how you’ll get around because lodging, meals and transportation are part of the guided hunting experience. JACO guides know their fields well and will help you hunt native mountain Merriam’s turkeys. There’s some hiking involved, so it’s a chance to get some good exercise, too. Want to explore the wilderness of New Mexico while on the hunt for native birds? Call 575-387-2665 or 505-379-5551 to plan your Spring turkey hunting trip today.